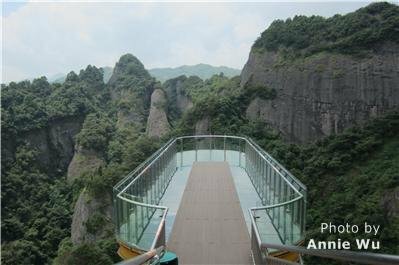 Tianmen Mountain, by Zhangjiajie city, in central China’s Hunan Province, has been called “one of the most beautiful mountains in the world” by many travelers who have been there. 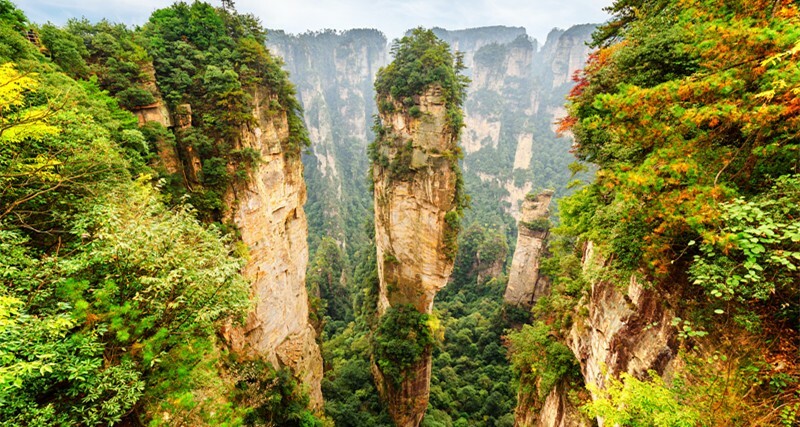 The stunning views including &apos;Heaven&apos;s Door&apos; and the 99 Bends, vertical cliffs, the thrilling cliff-hanging walkway and glass skywalk, and the world&apos;s longest cable car ride, make it unquestionably one of the best mountains to visit in China. 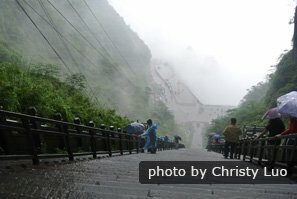 Come, climb the &apos;Stairway to Heaven&apos;! The mountain is best reached by cable car. The aerial tramway ride is the longest in the world, taking about 30 minutes for over 7 kilometers. The last part of the cable way is very steep, going up at 37 degrees over sheer cliffs to one of the mountain peaks. The cable car starts close to the bus station and railway station. It is often very busy, and waiting in line is normal. 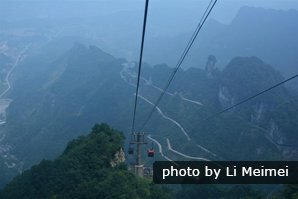 The cable car starts at 7:30 in summer and 8:00 in winter. Our guide will suggest our customers to arrive there early (half an hour or more before it officially opens) to avoid a long wait. 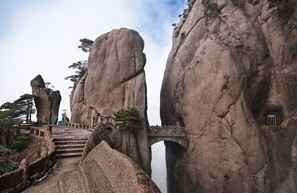 Otherwise you may need to queue for 2 hours or even more amongst noisy, chaotic Chinese tour groups. 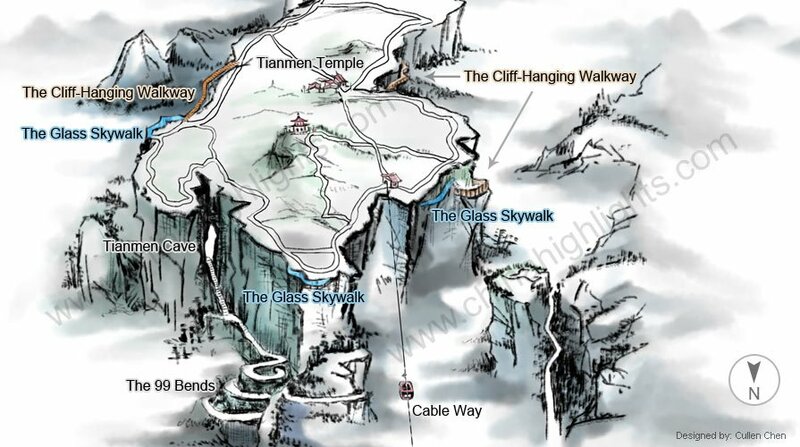 The walkway was built along the edges of this mountain&apos;s summits, clinging to the vertical cliffs. 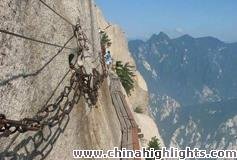 The walkway is about 1.6 kilometers long, about 1,400 meters high. The cliffside loop takes about 1½ hours. At the end of the walkway, there is a hanging bridge linking two peaks. 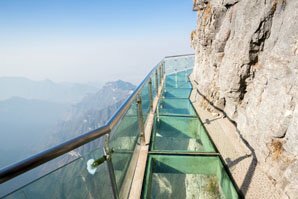 The third glass skywalk in Tianmen Mountain Scenic Area &apos;Coiled Dragon Cliff Glass Walkway&apos; (盘龙崖玻璃栈道) opened to the public on August 1st, 2016. It offers a new way to enjoy the stunning mountainous landscapes — though you might be too terrified to appreciate the views! 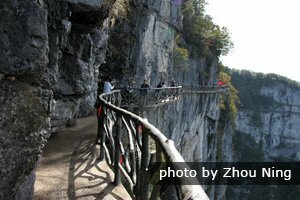 The Famous Original Skywalk — "The Walk of Faith"
The road is built for tourist use, taking tourists from the mountain foot to the top of the mountain and Tianmen Cave. 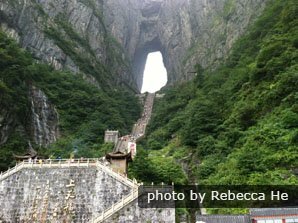 Tourist buses take travelers from the midway cable car station along some of these 99 bends to Tianmen Cave. The bus doesn&apos;t stop on the way. It takes about 20 minutes to the cave. 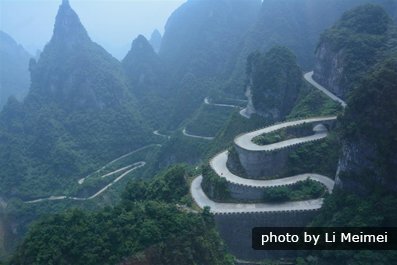 The ride, full of sharp turns along vertical cliffs, is not recommended for those who are easily carsick. If someone in your travel group don&apos;t want to take the bus, our guide will help find a good relaxing place for him/her to wait for the rest of you. 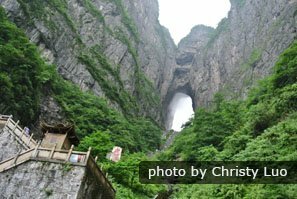 Tianmen Cave — &apos;Heaven&apos;s Door&apos; and the "Stairway to Heaven"
Tianmen (&apos;Heaven&apos;s Door&apos; 天门 Tiānmén /tyen-mnn/) Cave is a large (30 meters or 100 feet wide) water-eroded hole between two peaks, like a huge doorway in the cliff face. It&apos;s the highest hole of its sort in the world. 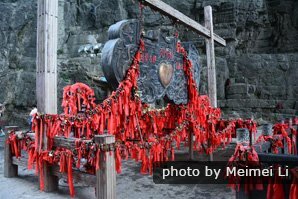 Then there are 999 steep and narrow steps up to the cave — "the Stairway to Heaven". It is a hard and tiresome climb (about 30 minutes). The views from the cave are quite plain, and it is always crowded, and hard to find a good place for photos. So it&apos;s only really worth doing to say you&apos;ve "climbed the stairway to heaven" and "knocked on Heaven&apos;s Door". The tour needs more than half a day, even a full day if you want to travel slowly. Our guide will remind you to bring some snacks / a picnic. Food sold at the small restaurants on the mountain is expensive, and the quality is unreliable. We don&apos;t arrange our customers to eat at the mountain restaurants. Take a chairlift to the summit (about 20 minutes wait and 20 minutes chairlift ride). Explore the summit, climbing to the top of a tower for a photo or bird&apos;s-eye view of the mountains. The mountain&apos;s tourist area is BIG. A guide is recommended to help you deal with all the above hassles and for finding good places for photos. 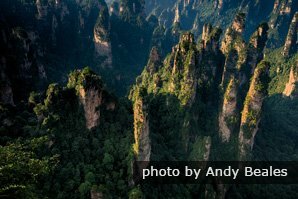 See more our Zhangjiajie tours, or contact us to tailor-make a tour according to your specific requirements.